Australia’s victory over Papua New Guinea in the Oceania Cup early this morning means that the Green Army have qualified for the World Cup Finals in 2018. This is only the fourth time in the 43 year history of the World Cup that Ireland Women have taken part. Head Coach Graham Shaw said “we are delighted to receive confirmation of qualification as this was our No 1 objective for 2017. We want to be competing in all major competitions and the World Cup in London will be special since Great Britain won the gold medal in Rio. I am sure they will put on a fantastic show, that we are proud to now be a part of”. 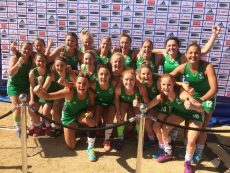 This is a fantastic achievement and the culmination of a successful summer with both of Ireland’s men’s and women’s teams now qualified! The last time the men were in the World Cup Finals was 1990 and the women have not featured since 2002. The intervening period since qualification has been a flurry of planning as all the qualified nations settle their preparation programs for the run in to both World Cups. The women will be first up in July 2018 in London while the men will play in late November 2018 in India. The women have finalised their program which will see a number of single nation match series against Scotland in October and both Scotland and Great Britain, the Olympic Gold medalists in March as well as a tri-nations tournament in January in Spain with Belgium, the recent European Silver medalists also featuring. The men will start their program after Christmas and a key highlight of their program will be attending the Sultan Azlan Shah Cup in Malaysia in March. Great Britain are the holders of last years 26th edition of this prestigious tournament. The men’s program will also include a tri-nation tournament in Spain with Netherlands at the end of January along with some home games to be finalised. To accommodate both teams World Cup preparation programs, a number of changes have been made to the domestic Calendar for this season to ensure that our national squad players are available to their clubs for the EY Hockey League and Irish Senior Cup. The updated Calendar is available on the website here and both Competition WG (IHL and Cups) will be in touch with clubs to communicate the changes. Both national coaches wish to thank all the clubs and players for the huge support throughout the summer and for the journey ahead as they head into their respective World Cup competitions. It really is an exciting time for Hockey Ireland to have both teams competing in World Cups in the same year!